Daffodils (also known as jonquils or narcissus) are the March birthday flower. In the Victorian era, daffodils meant, “You are an angel.” In the modern language of flowers, daffodils are a symbol of domestic happiness and friendship. Both meanings hold very nice sentiments. The daffodil is considered the national flower of Wales. On St. David’s Day, March 1, many folks wear the national flower on hats or lapels. The daffodil competes with the leek as the Welsh national symbol. The reason for this is that before Wales was a part of the United Kingdom, the Welsh fought English troops to keep independence. The Welsh were directed to put leeks on their caps to distinguish their soldiers from the English troops. 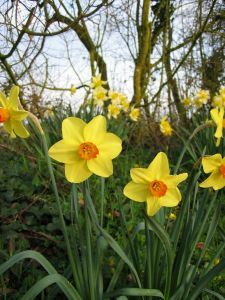 The United Kingdom prefers the daffodil for the national symbol, as it is not a symbol of defiance. When planting daffodils, place bone meal in the dirt that is placed back over the bulbs, per package directions. The bone meal gives the bulb nourishment over a long period of time while the bulb establishes itself and replicates. 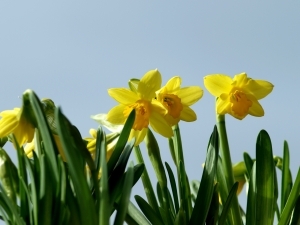 Once daffodils are planted, they can naturalize a yard or roadside if left undisturbed. Do not cut the foliage of the daffodil; allow it to die down naturally. Daffodil aren’t usually bothered by deer or rodents. The sap of the daffodil contains crystals that are sharp on animal tongues. When picking daffodils for the home, try singeing the stem base with a lighter to prevent sap from leaving the stem. If you have daffodils that just plain droop, a vodka-and-water mix will act as a stiffener for the bloom stems. Daffodils are natives of Southern Europe. The word “jonquil” comes from the Spanish ‘jonquillo,’ meaning a rush, as the foliage looks like rushes. Photos by John Nyberg and Samuel Rosa. Ooops, I just was cleaning up the garden area and I cut back the daffodil foliage to about 3-5 inches from the ground. These are well-established daffodils, that I am only recently “looking after”. Are they goners? I bet they’ll be fine. The only way to know for sure is to see if they come up and flower next year. I would just let them be and see what happens.